For the course upgrade, all the changes have already been made, and the course is in the exact same place, so you don’t have to do anything at all! It’s all already there. Problem: Many students struggled to complete the week-long daily journaling/drawing assignments, ended up dropping off course at this point. Solution: I changed the week-long assignments to just one day, and created the daily drawing challenge (#MightCouldDrawToday) separate from the course as another way to encourage and build up a daily drawing practice. Problem: Some students had a hard time logging back in and picking up where they left off. Solution: I added a new section at the beginning of the course, Using this Platform, to show student how to bookmark the course, track your progress, download the Teachable app, and speed up the videos. Problem: Some students wanted more explanation of purpose or intent after each assignment. Solution: I added a Why We Did It note at the end of each assignment, explaining why I included the assignment, and what it was intended to encourage. Problem: Everyone loves the course, but most people have not completed the entire course, dropping off at some point. Solution 1: Most people dropped off at the week-long daily assignments, so my previous change should help here. Solution 2: I had been experimenting with rolling enrollment periods, but I am now going back to just 2 launches a year, so each group of students will come in together as a larger group and can more easily travel progress the course together at the same pace. Problem: Students wanted a more fluid way of sharing work than Facebook. Solution: That’s our new community, baby! More on that below. Problem: Once students completed the course, they still wanted to be part of the community, but were unsure how to do so. Solution: Our new community will have a private area for current students, as well as a more general area for non-students (in the future) and alumni so they can continue chatting, sharing and growing together even after the course is over. Problem: Some students asked for basic drawing lessons or demonstrations. 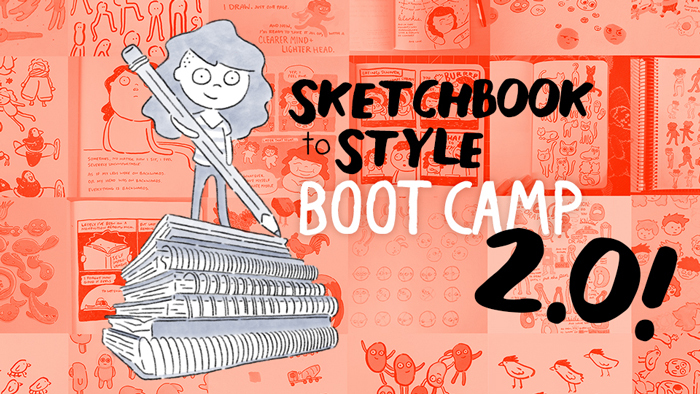 Solution: This is is a planned part of the new overall system, but will not be a part of Sketchbook to Style, as the purpose of this course is for you to discover your art, and I don’t want to heavily influence that. To give you a quick preview: there will basically be a new introductory class for people who are not quite ready for this course, which will include basic drawing lessons and demonstrations. See more on this below. Problem: Some students said the coloring assignments were a bit tedious. Solution: I simplified these assignments a bit, and now recommend colored pencil instead of crayon. Problem: Some students had trouble with the childhood cartoons assignment, having a hard to remembering what they looked like, and freezing up on this assignment. Solution: I redesigned this assignment to have the same effect, but work better overall and not be as intimidating. Problem: There were a few other miscellaneous assignments people got stuck on, and weren’t sure of what to do. Solution: I went through every assignment, and clarified and simplified the instructions. I also added a section called A Note on the Assignments under the section Using This Course, to try to get people in the right frame of mind for the there-is-no-wrong-answer mindset of the course. Problem: Some students asked to organize meetups + workshops in the future. Go back to the post about our move here! Or log back into the course curriculum here!